I just finished reading Decision Points by George W. Bush. He failed to convinced me that invading and taking over Iraq--as opposed to just destroying the Iraqi military bases and their suspected WMD sites--was the best option. I was also not convinced that the TARP program and all the Bush bailouts were the best option. He says that all of the economists he trusted were telling him the economy would collapse without it, but he fails to convince me that he gave alternative views any serious consideration. However, having said this, the book did reinforce my previous conviction that much of the vitriolic hatred leveled against him was unfair, unjust, often hypocritical and more about power than concern for America. 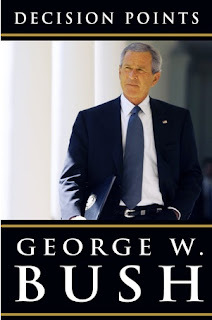 The book provides a fascinating behind-the-scenes account of the major decisions of the Bush presidency. It was outstanding. I found it hard to put down.